Thursday was my final day in Shanghai. After spending all of Wednesday at Electronica Asia, I headed over to the Espressif Headquarters which is just one subway stop away. This is of course the company behind the well-known ESP8266 and its younger sibling, the ESP32. My host was Ivan Grotkothov, Director of Software Platforms. The backstory on how he found his way to the company is truly interesting, as are the stories he shared on some of the legend and lore surrounding the WiFi capable chips the company makes — and the new one whose existence just leaked out this week. Join me below for that and few other fun things from my last day in this city of 26 million people. Why Did that 8266 Have So Few GPIO? It’s no secret that Espressif is growing like crazy right now. The ESP32 chips are household name (in hardware hacking households) and are finding their way into smart devices by performing tricks like on-chip keyword recogntion. Today I even heard mention of rudimentary facial recognition. They’ve come a long way since the early days of AT-commands and very limited GPIO on the original ESP8266 offerings. That said, it was the low cost to adding WiFi to any project made the chip revolutionary. 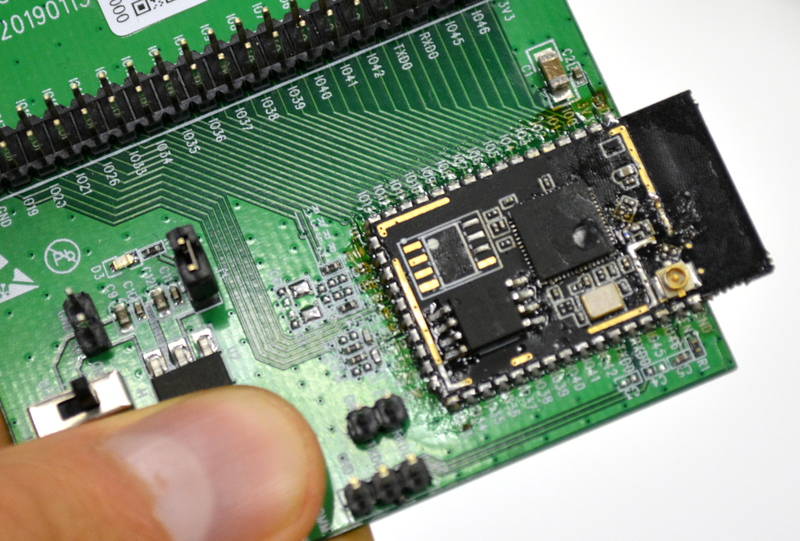 Ivan provided some color to the story of those early beginnings — the original intent was not for the chip to itself serve as a main controller, but to be a simple way to add on wireless connectivity. This explains the AT command firmware that originally shipped with the modules. But the company realized that many devices, like smart light bulbs, didn’t need many pins or much computing power, so the chip began to be used as a standalone controller. That led to the desire for more GPIO, which we saw with the release of the ESP32. But check this out, there’s a new Espressif chip just around the corner. Earlier this week a Tweeted photo of a new chip sans specs started the rumor mill. The package has “Chip7″etched on it. Ivan let me take a photo of the board, which he confirmed carries an engineering sample. I couldn’t get much in the way of timeline from him, but he tease a few hints while we were recording an interviewing for the today’s Hackaday Podcast. The new part follows the lineage of ESP32 but will have more GPIO and will likely be similar in power budget and speed. Listen to the podcast for Ivan’s own words on the hardware, click the image for full resolution, and start your wild speculation in the comments below. I am fascinated by the story of how Ivan came to be at Espressif. He had first learned about the ESP8266 while living in St. Petersburg, Russia and working on an idea for a car-sharing startup. He needed a way to unlock the shared vehicles using a smartphone, and WiFi was one method he was investigating. Non-technical issues, like how to insure drivers and shared vehicles, meant the idea didn’t take off. But meanwhile he was having fun with the chip, exploring beyond the AT commands to begin writing his own code. He knew the true potential was in multithreaded behavior. After taking a protothreads approach and implementing a few other modules, he landed on the idea of porting portions of the Arduino ecosystem to the chip. His hobby project was the best handling of the WiFi stack for ESP8266 at the time and others joined in the effort to flesh out the rest of the peripheral support. This caught the eye of Espressif’s CEO and he reached out to offer Ivan a job. Seems the company is hiring hardware hackers doing interesting things with their chips (Jeroen Domburg — Sprite_TM — has a similar path to the company) and I like that philosophy! After my visit so Espressif I set out for the subway to make my way back to the airport and happened upon some unique advertising. The subway between the Zhangjiang High Technology Park stop and Longyang Road Station featured an LED billboard outside the train… while it was moving at full speed. The display uses persistence of vision so that to your eye the video ads are moving along with the train, rather than whizzing by it. POV displays are notoriously difficult to capture well on camera and this one is no different. The rolling black bars are not present when viewing this in person but I think the installation interesting enough to share this video anyway. Actually, I thought it neat enough that having missed the show the first time, I rode back one stop so I could see it (and film it) again. From the subway I transferred to the maglev once again to fast travel to the airport. 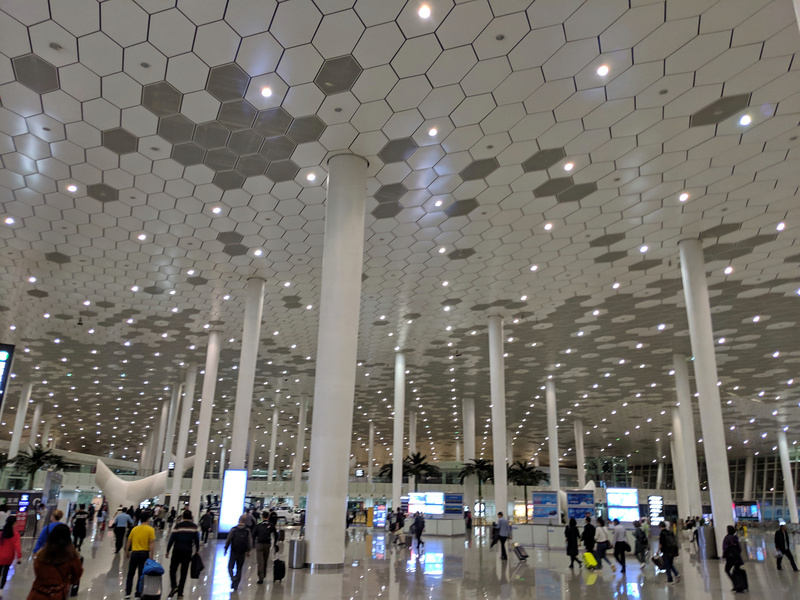 My Thursday flight to Shenzhen was a late one, but it means a full Friday to catch up with our friend Scotty Allen, for the Hackaday Meetup at X.Factory Friday evening, and to spend the day in the electronics market on Saturday. I let you know how that goes in future articles. Very thin layer of batter, followed by an egg. For now, here’s a pair of photos of the delicious street-food breakfast I grabbed on this final morning in Shanghai. Portuguese speaking folk spells 7 as “sete” which is very similar to “set”; hence Chip-7 would sound like “Chipset” Unintended coincidence? I am from Brazil… Yes, you are completely right ! If that display on the Shanghai subway is the same sort of thing I saw in Chengdu, it is not persistance of vision, it’s a very long video screen which scrolls horizontally at a speed matching the train. At least as far back as May 2011 there has been a lower resolution LED POV display in the tunnel under beacon hill on the Seattle light rail which deals you a poker hand as the train rolls by (I think this is a set of five single vertical strips of RGB LEDs (one strip per card image) spaced a second or so’s travel apart in the tunnel). @mikeselectricstuff: that’s hella cool. And won’t have the blinking problems that the ones in DC definitely did. We had them in Los Angeles for a little bit maybe sometime around 2007. I saw it on the Red line between Universal Studios and North Hollywood. Much lower resolution back then. I think it was showing an ad for Target. Yes, this is what I think is happening. But isn’t that still persistence of vision? The rate that each column of LEDs is updated is not synced to the motion of the video file, but to the motion of the observer’s eye. I guess in the same sense that all video is based on persistence of vision. Interesting animal motif. Sure there’s a story between that and WiFi chips. Hey, I’ve got a cartoon face now too! São Paulo subway line 4 has this kind of display too. Thank you Mike for sharing this with us.